The Shield in a rare moment of unity in 2017. I have a confession to make. I loved the Shield. Starting with their first appearance at Survivor Series 2012, I loved watching them work together. They had many amazing six-man tag matches in their two years as a team, during their first run. Waiting for their surprise appearances during 2013 was one of the reasons that year was among my favorites in WWE history. But the past is the past for a reason, it never truly comes back. As we look back on the Shield Reunion in 2017, it had a lot of factors working against it. Seth Rollins, Dean Ambrose and Roman Reigns had all gone onto greener pastures and the quality of teams for them to fight doesn’t really exist in the 2017 brand extension WWE world. The deck was stacked against them by outside factors and then the WWE made other booking choices to simply make it a lot worse. 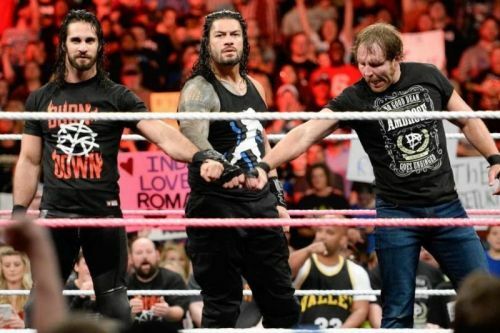 As we look back on The Shield’s underwhelming reunion in 2017, I present my five reasons why the Shield Reunion of 2017 didn’t work. 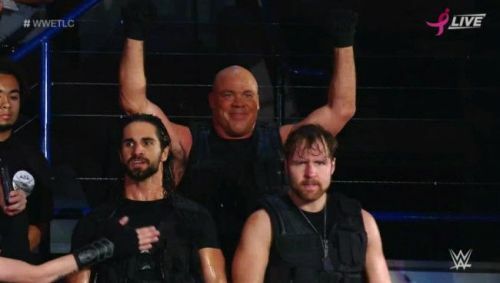 The Shield with their dad. I got into professional wrestling during the Monday Night Wars. One of the things I enjoyed most were the cool stables like the nWo. The nWo was at its best when the faction was small. The chaotic unit of Hulk Hogan, Kevin Nash and Scott Hall was simply the best version. As it got way more bloated, it took away the original cool factor. The Shield is the exact same way. The Shield is Rollins, Ambrose and Reigns. They are all excellent in-ring workers whose styles complement each other well. They referred to themselves as brothers and acted the part in their in-ring work. That is why it hasn’t been working in 2017 with replacement Shield members. Sure I loved seeing Kurt Angle wrestle at TLC 2017 but we were provided with no logical reason for Angle to fight with the Shield. And having Triple H as a Shield member overseas? It makes no logical sense. That idea is beyond ridiculous with the long history of Triple H fighting with and breaking up the Shield in the past. There is only one Shield and using other members dilutes the appeal of the group.